smart home appliances and face/voice recognition solutions in our everyday lives. These terms might be quite widespread but they can lead to confusions as they are very much related and being used interchangeably. Artificial intelligence has a longer history than machine learning. It might sound like a new term but we can say it has been studied and improved over the years since Aristotle introduced syllogism, which was a method of formal and mechanical thought. The real birth of the current understanding however starts in the 1940s and 50s with some scientists from mathematics, engineering, psychology, economics and political science who put the idea of ‘creating an artificial brain’ on the table. This led to the foundation of the field ‘Artificial Intelligence’ as an academic discipline in 1956. During this period, Alan Turing published “Turing Test” that speculates the possibility of creating machines that think. In order to pass the test, a computer must be able to carry on a conversation that was indistinctive from a conversation with a human being. This was the first serious proposal in the philosophy of artificial intelligence, which can be explained as: a science developing technology to mimic humans to respond in a circumstance. In simple words AI involves machines that behave (think) like humans, in general. As seen above, we can consider Machine Learning as a subset of AI. When Artificial intelligence is the whole idea of a technology that behaves like a human, machine learning algorithms are about finding patterns and invariants in big data. These self-learning algorithms enable the machines to learn from data sets (inferential statistics) and they are a series of steps that lead to the completion of a task. Artificial intelligence encompasses other areas apart from machine learning such as knowledge bases, natural language processing, robotics etc. Also symbolic logic (rules engines, knowledge bases, expert systems etc. ), Bayesian statistics, robotics and evolutionary algorithms can be described as AI, however none of them are machine learning. 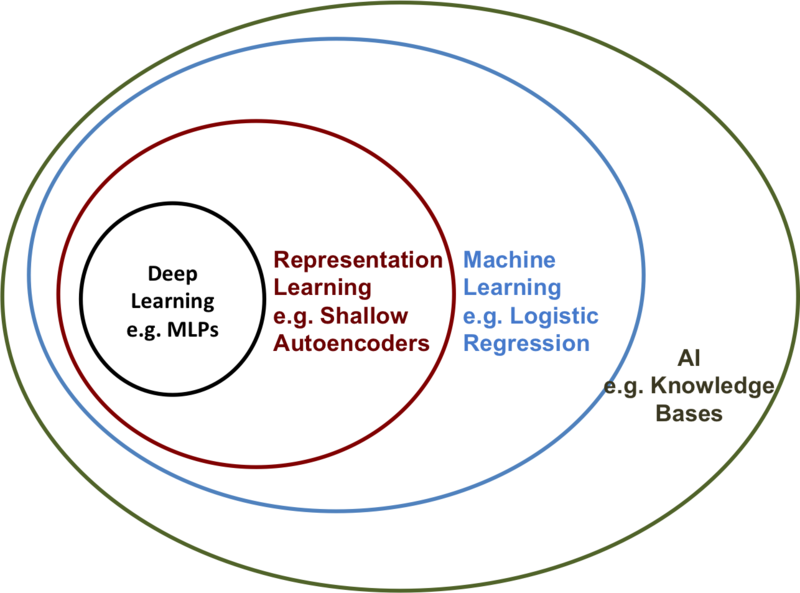 You can also see a Venn diagram from Ian Goodfellow’s Deep Learning book below, showing how machine learning is used in many but not all approaches of AI. Machine Learning algorithms detect patterns in existing data, identify similar patterns in future data and make data driven predictions. These algorithms evolve behaviours based on empirical data, so they can accomplish more than coding software routines with specific instructions, by adapting new circumstances. Thus we can simply say that the machines are ‘trained’ to learn from experiences how to perform a task. The most common example would be Google search. When you misspell a search query, let’s say you wrote ‘speling’; Google machine learning algorithms warn you as: ‘Did you mean spelling?’ or direct you to search ‘spelling’ automatically. This can be achieved by numerous examples the algorithms detect (like when you immediately realise the misspell and correct it; Google algorithms recognise that you searched for something after searching something else) and keep in mind for future users who make similar misspells. In simple words, they learn to correct you. In addition to Google algorithms, recommendation engines (shopping, Netflix movie, social media etc. ), rankings (ads, newsfeed, search) and knowledge navigators (Siri), can be counted as further real-world ML applications. Of course machine learning is used in many other areas and for more complicated solutions such as fraud prevention, risk analysis, gaining batter customer insight and improving medical science among other uses. As you can see, AI is basically the ‘intelligence’ or the ‘technology’ while machine learning is the implementation of the computational methods that support it. After AI has been around for so long and not that ‘exciting news’, ML has certainly given that oomph with some interesting applications. When Google DeepMind’s AlphaGo program defeated South Korean Master Lee Se-dol in the board game Go, it became quite clear that AI and ML have a lot to offer and why the big players are making them their central focus. It is inevitable that we will hear about them more and see further innovations and emerging technologies.